Keep the garden looking cared for by making sure all grass areas are regularly mown and borders are weeded. Add a splash of colour by planting shrubs or flowers in the borders or introducing a few pots or hanging baskets. Power wash driveways to return them to their ‘newly laid’ look. Even if you don’t think your drive is particularly dirty once you start washing you will be amazed at the difference! Make sure all fencing is in good order and not rotten or falling over. Replace panels which are broken and apply wood stain every two years to maintain appearance and protect it from the elements. Ensure window panes are clean and PVC frames wiped down. If you have wooden frames ensure they are painted regularly to maintain their appearance. Soffits also require regular maintenance to keep them looking good. 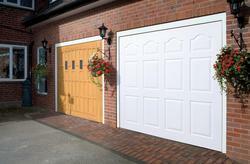 Check the appearance of your garage door. For most properties, the garage door takes up a considerable amount of the exterior space and so if it is looking shabby it will have a detrimental effect on the whole appearance of your house. Sometimes a lick of paint will suffice but if there are more problematic issues then AJS Garage Doors can advise whether the door can be repaired or whether a new door would be the most sensible option. Take a look at our ranges such as Garador Garage Doors or Cardale Garage Doors to see just what a difference a new door could make to the appearance of your property.